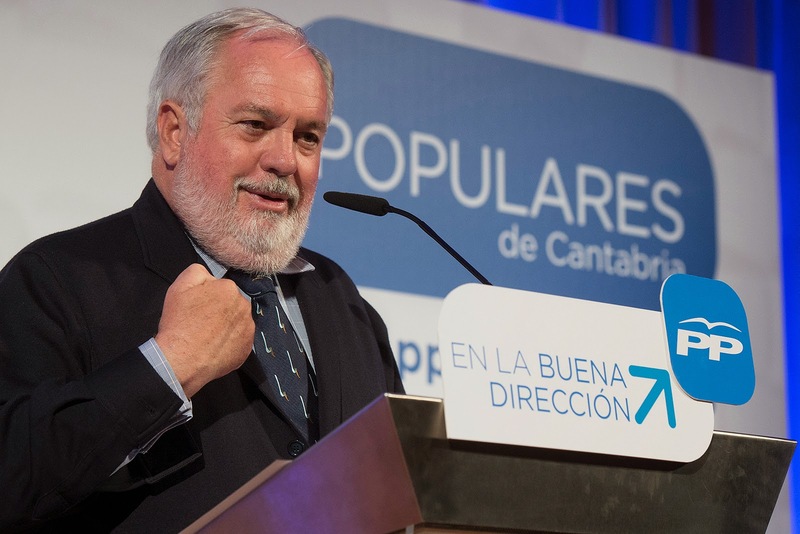 EU’s climate chief Miguel Arias Canete. Photo credit: Partido Popular de Cantabria via Flickr. Europe will be an issue in May’s General Election. Nigel Farage will make sure of that. Whatever you think of UKIP’s policy proposals, (I think they’re appalling), we have to accept that Farage is better on TV and more charismatic than any other party leader. So 2015 will be the first time since 1974 that Europe has been a significant general election issue. It wasn’t in 1983, despite the Labour manifesto saying it would take the UK out. I went canvassing for the SDP that year – I’d joined them because they wanted to stay in Europe (and because Shirley Williams was inspirational). Voters were interested in the economy and the Falklands, and Margaret Thatcher was being quite moderate (by her standards) on the issue of Brussels. Michael Foot’s choice of coats was a higher political issue than European membership was. I joined Labour in 1986, after Neil Kinnock had made them pro-European. In the 1992 campaign I worked for Labour HQ: my job was to attend the Tory and Lib Dem press conferences. The Tory internecine war on Europe was in full swing behind the scenes, but John Major successfully kept the lid on it during the campaign. Even Paddy Ashdown didn’t mention Europe often: presumably pollsters had told him that there were no votes in being pro-Brussels. Green issues also haven’t been an electoral issue in the past. Unfortunately, they’ll be largely absent again this year. The ‘Green surge’ already looks like it’s past its peak. Natalie Bennett and Caroline Lucas are effective and quite impressive – though wrong on key energy issues in my view. The Greens’ popularity has more to do with them picking up protest support from the Lib Dems than it does with increase public attention to environmental issues. The Green Party of England and Wales is not a big fan of the EU; the Scottish Greens are a bit more enthusiastic. Greens favour an in/out referendum on the UK’s membership of the EU. Lucas says that the EU”must urgently change direction, away from an obsessive focus on competition and free trade and towards placing genuine co-operation and environmental sustainability at its heart”. So voters in England can choose between three parties calling for an in/out referendum: the Greens; the Tories, who have moved from “vote blue, go green” to ‘cut the green crap’; and UKIP, who deny climate change and hate wind farms almost as much as they hate Eurocrats. Or they can chose the Lib Dems, who say that any referendum held to decide whether to transfer more power to Brussels (as the UK’s 2011 European Union Act requires it must be) should be an in/out referendum. Or Labour, which has said that it would retain the 2011 ‘referendum lock’, but not made clear whether it would regard a referendum as in/out. The SNP and Plaid Cymru’s line on an EU referendum is that each part of the UK should be given a veto over whether the UK leaves – they don’t want a referendum unless the 2011 Act requires there to be on. This referendum lock is not likely to be relevant during the next UK parliament; Europe’s leaders have more pressing issues than treaty change to deal with. So, if you want an in/out referendum, vote UKIP, Tory or Green. But if you think that climate policy and environmental protection are higher priorities, vote Labour or Lib Dem. Because most of the UK’s green policies come from Brussels, not Westminster. Outside the EU, the UK could theoretically become a new Norway, with very high environmental standards. Pigs could also fly. Environmentalism has been a constant theme in Norwegian politics for over a quarter of a century (despite Norway’s large oil and gas sectors). Prime Minister Gro Harlem Brundtland chaired the commission which produced ‘Our Common Future’ in 1987. Kjell Magne Bondevik stood down from the premiership in 2000 because he refused to accept his coalition partner’s demand for a new gas power. No British prime minister would consider resigning the premiership over an environmental issue – regarded as second order by British politicians and the media. In reality, the UK outside the EU would return to being the dirty man of Europe. EU membership has not been entirely positive for the UK environment. The common agricultural policy (CAP) and common fisheries policy (CFP) are environmentally destructive as well as economically wasteful. Nevertheless, UK membership has delivered substantial green benefits. Since Britain’s accession, policies to protect or improve air quality have emanated from Brussels, not London. The concept of BATNEEC (best available techniques not entailing excessive costs) has been used in EU directives to regulate air pollution since 1984, and water and soil pollution since 1996. The 1988 Large Combustion Plants Directive regulates the emission of sulphur dioxide and nitrogen dioxide and will also require the closure of several UK coal-fired power stations over the next decade – as long as we’re still in the EU. Catalytic converters, which reduce carbon monoxide and nitrogen oxide emissions, have been mandatory in Europe on petrol vehicles since 1992, and on diesel vehicles since 2008. As a result of these European measures, air quality in Britain has improved. Emissions of sulphur dioxide in the UK fell by 89 per cent between 1990 and 2010; emissions of nitrogen oxides by 62 per cent. Air in most British cities is not clean enough to meet the EU standards or, more importantly, to protect human health: air pollution causes 29,000 premature deaths in the UK each year. But the air would be much dirtier, and the death toll much higher, without the Brussels bureaucrats. Bathing water would be much dirtier too. Successive UK governments sought to use every loophole in the water directives, and allowed the discharge of untreated sewage into the sea until 1998, longer than any other European country. The water directives have delivered major benefits to wildlife in Britain. In the 1950s, the river Thames was biologically dead, with no fish or mammals, due to sewage in the lower reaches (around London) and agricultural pollution in the upper reaches. Today there are many fish throughout its length, and seals and dolphins swim up to London. The 1979 Wild Birds Directive and 1992 Habitats Directive have led to the establishment of a Europe-wide network of protected sites, called Natura 2000. The UK has established many onshore protected sites, though it has been slow to establish offshore sites. The EU has been regulating chemicals since the 1960s. However, before 2007 there was a major flaw in European chemicals policy. Chemicals which had been on the market before relevant legislation was adopted (which for most substances meant 1981) could continue to be sold, without any testing. New chemicals had to be tested to ensure that they were safe for humans and the environment. This was an obvious barrier to innovation. Over 30,000 chemicals – 90 per cent of those being used in 2007 – had been in use since before 1981. So no one knew what health impacts they might have. The substances were in products such as electronic equipment or paints and cleaners, but also in products for which the public would not expect or accept untested chemicals, such as children’s pyjamas. Tony Blair used the two UK presidencies of the EU which occurred during his premiership (1998 and 2005) to push for better regulation – which for once he understood actually meant better regulation rather than deregulation. In 2007, the EU adopted the Regulation on Evaluation, Authorisation and restriction of Chemicals’ (REACH). This is based on a sensible approach: ‘no data, no market’. Chemicals that have not been properly assessed, or which fail the tests, must be withdrawn from the market. REACH is expensive, but the savings will be greater than the costs. A third of all occupational disease is caused by exposure to chemicals. BASF, Europe’s biggest chemicals company, has dropped its opposition to the law. Its vice president for chemical regulations, Ronald Drews, said in September 2012 that REACH had cost BASF over €500 million, but that “at the end, it is worth the money”. Last year I heard Ed Davey give an impassioned defence of REACH. He argued – rightly – that before REACH, parents could unknowingly buy toxic, flammable pyjamas for their children. In February I went to a conference organised by David Campbell Bannerman, a Tory MEP who has published Time to Jump, outlining what he says is ‘a positive vision of a Britain outside the EU’. In his speech he condemned the excessive red tape from Brussels, giving three examples: the Working Time Directive, the Large Combustion Plants Directive, REACH. So I asked him whether he agreed with Davey that REACH has some strengths, including the banning of dangerous pyjamas for kids. In reply he said that the UK parliament could ban these. Yes, it could – but probably would not. As argued above, the Large Combustion Plants Directive has been central to cleaning up the air. The impact of the Working Time Directive on private companies has been limited. It has had more impact in the public sector, including in the NHS. I’m not convinced that I’d like a surgeon who had worked more than 48 hours that week to operate on one of my kids. But the Working Time Directive should be discussed and, if necessary, reformed. That’s how the EU works – everything is constantly discussed, and sometimes reformed. This directive has become a bugbear for the Europhobes (sceptics is an inaccurate word for them, just as it is for those who deny climate change). It is not worth leaving the EU over the Working Time Directive – unless you are a free marketer with an ideological objection to any regulation of anything. Many speakers at February’s conference criticised the “ideological” enthusiasm of people like me for all things emanating from Brussels. They clearly want people to believe that their objections to the EU are based on pure analysis and evidence-based policy making. I don’t think the British electorate is that stupid. But I’m an optimist (a useful attribute for someone who works on climate change all week, then for ‘relaxation’ goes to White Hart Lane to support Spurs). I may be wrong. If I am, and if the UK leaves the EU, conservation and anti-pollution policies will pay a heavy price. Stephen Tindal is a climate and energy consultant.